Biography: He graduated from the Karaganda Polytechnic Institute in 1982 with a degree in Industrial Transport – a classification of an industrial transport engineer. After graduation, he was engaged in research and production activities at the enterprises of Karagandaenergostroy and Giprouglegormash. 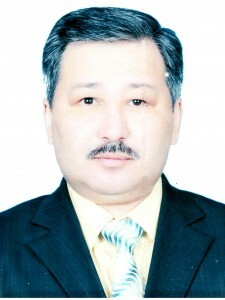 From 1987 to 1990 he was a postgraduate student at the Department of Industrial Transport at KarPTI, from 1990 to 1997 he worked on distribution in the Kazakh Research Institute of Coal (KNIUI, Karaganda). Since 1997, he worked at the Saryarka branch of the road (now the Karaganda branch of the road) as a second category engineer, chief specialist and head of the department of engineering structures. Since 2002 she has been working as an associate professor at the department “Industrial Transport” at KSTU, she has been conducting disciplines “Research and design of railways” and “Fundamentals of the design of transport devices and facilities”. In December 2002, he took advanced training courses in Almaty at the Kazakh Academy of Transport and Communications (KazATK). Participated in the development of documents for the opening of magistracies in the specialty “Organization of transport, traffic and transport operation.” In 2005, as chairman of the PWS commission, he participated in the UNT state program. During his career, he received 15 copyright certificates for the invention, has more than 30 publications in foreign and domestic editions, 4 of them are monographs, 4 certificates of intellectual property, participated in research projects, the results of which were the development of technical and technological tasks for the use of cyclical flow technology in quarries, the development of a working draft of the conveyor complex. In 1996, he successfully defended his thesis in the specialty 050505 “Lifting transport vehicles”. Scientific works: 6. Akashev A.Z.